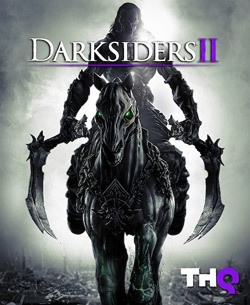 The Darksiders franchise is a series of hack and slash action adventure games in which you play as one of the Four Horsemen of the Apocalypse. The first game puts you in the shoes of War, the second has you play as Death. As Horsemen of the Apocalypse, these characters are accompanied by their dreadful steeds Ruin and Despair. And while I usually appreciate horse realism here on The Mane Quest, Ruin and Despair have my love and respect for their sheer ridiculous badassery. Their over-the-top evil designs, their ominous names and the ghostly smoke and hellfire surrounding them are a welcome change from realistic or cute portrayals of horses. More importantly, Ruin and Despair are not just exchangeable mounts, they are trusted companions that are part of the games’ stories. When publisher THQ declared bancrupcy in 2012 — only months after the release of Darksiders II — another entry in the series seemed unlikely to happen. 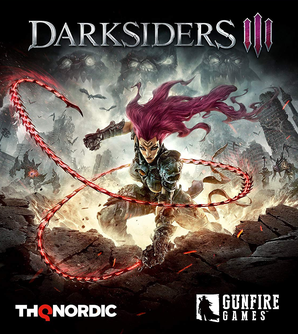 Fortunately, the Darksiders property was eventually bought by Nordic Games, nowadays known as THQ Nordic. The development of the next game was given into the hands of Gunfire Games, a company founded by core members of the defunct Vigil Games, which developed the first two titles. When Darksiders III was finally announced in May 2017, almost five years after the previous title, I was thrilled! Not just because that meant I would get a new ridiculously badass video game horse (right? ), but also because by that time, I had just about finished playing The Legend of Zelda: Breath of the Wild and was hoping Darksiders III would bring back the classical item-based progression that the two franchises used to share — but which was absent from Breath of the Wild. With War and Death having had their turn, the remaining siblings are not the biblical Famine and Pestilence, but a female Horseman named Fury and a male Horseman called Strife. Darksiders III will thus be the first (and likely only) entry in the series to feature a female protagonist. With the artistic liberty taken in name and gender, what about the “horse” part of Horseman of the Apocalypse though? Unlike her brothers before her, Fury is not depicted with a mount on the cover art of her game. With more and more trailers coming out but not a single one showing even a glimpse of Fury’s steed, I began to fear that the concept of the horse companion had died along with the former developer and publisher. And while I also greatly enjoy the franchise for its gameplay, designs and story, getting no new badass horse in Darksiders III would have made me pretty damn sad. She's a Horseman of the Apocalypse, of course she has a horse. After a search for news on Fury’s horse in the Darksiders subreddit, I found a tweet to give me hope, however: In response to a fan’s concern, the Gunfire Games Twitter account confirmed the existence of Fury’s horse in October 2018. Fans are speculating about the name and looks of the mount: Fury has been referred to as the “Rider of the Black Horse” by the developers, with Scorn, Regret or Torment being popular fan suggestions for its name, roughly following the themes of the first two games. Gunfire Games promised more information “closer to launch” on Twitter back in July, but nothing new has been revealed yet. This tweet from August would imply that the Darksiders III booth at gamescom 2018 had a life size statue of the steed, but I cannot find any pictures of it unveiled. With the horse’s inclusion confirmed, the next question would be why the design and name of Fury’s horse have been kept a secret after her predecessors’ were prominently featured in their games’ promotional material. 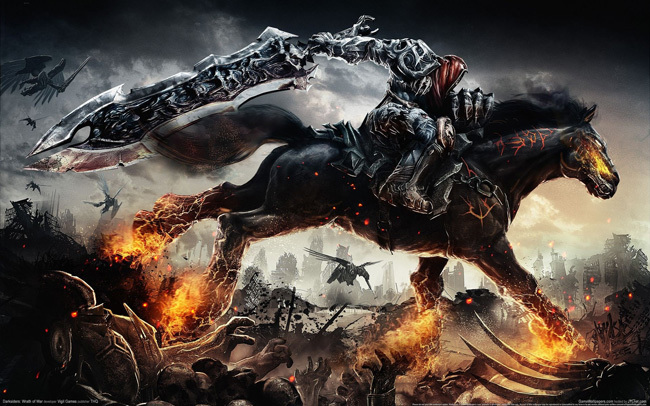 In the first Darksiders, the player only gets access to the mount after breaking the horse free from a thieving demon. In the 2012 sequel, the horse is available from the start. 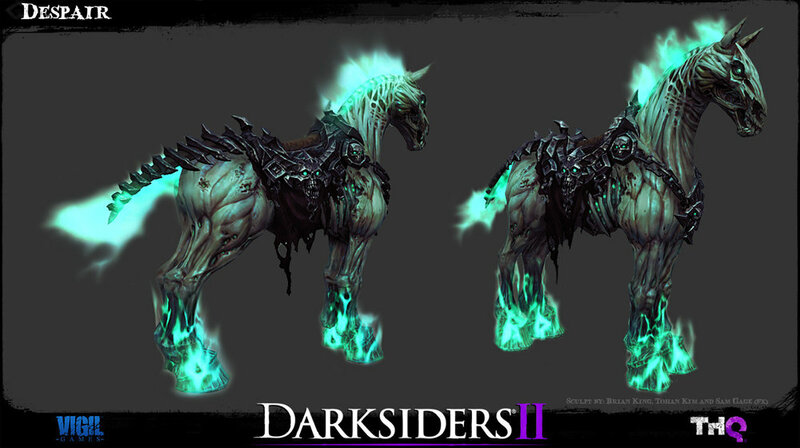 Were enough fans disappointed by the mount feeling less “earned” that way that Darksiders III decided to knock it up a knotch by using even the first glimpse at the steed’s design as a reward mid-game? Is the horse somehow significantly different from Ruin and Despair? Does THQ Nordic think not showing the horse is more intriguing than advertising its looks? With the game coming out in just 10 days, we will hopefully have an answer soon. An unboxing live stream from November 20th reveals a look at the art book of Darksiders III, which includes a brief glance at Fury’s horse Rampage. In it, one can see that the new steeds has a mane and tail of fire or smoke, reminiscent of Despair. I look forward to seeing the new horse in-game in a few days! An early review implies that there is no horse gameplay at all, and that the horse barely features in the story.